"Express yourself" is the latest exterior design trend if you want to differentiate your home from your neighbors'. Whether you've opted for fiber cement, vinyl, stucco or wood, choosing interesting house siding colors is the best way to make your home well known. Architecture: Your home's style won't change. The roof color, driveway, sidewalk and foundation are also complicated and pricey to alter. Neighborhood: Look at the color schemes already in place. How much do you want your home to stand out? Do you have an HOA? If so, be sure to check appearance guidelines before you apply paint. Environment: Are you surrounded by a sun-baked desert, lush greenery or a coastal landscape? These three regions combine their colors and textures decisively. Southwest. Stucco is a common siding choice for homes in the Southwest. With a landscape that includes warm earth tones, common shades include tan, taupe, gray or ochre with terra-cotta, sage or reddish brown accents. Southern California. Early 20th-century Craftsman bungalows feature natural materials, like brick and exterior wood siding, in earth colors that ground the house. From raspberry to deep wine and silver, gray or taupe with green or mahogany accents, using historically accurate Craftsman colors can make a huge difference in curb appeal, whether the siding is stained or painted. Northern coasts. Fiber-cement mimics wood without the same durability and maintenance issues. 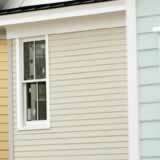 It has become a favorite siding choice across the country, particularly on both coasts. Sherwin-Williams suggests that slate blue and dusty red are still popular siding colors, particularly when paired with lighter accents such as gray, tan, cream or white. Speaking about low-maintenance siding for Residential Design + Build Magazine, Van Garber a Vice President of Marketing with Owens-Corning had this to say about Northern Coastal homeowners' color choices: "People are going for a softer look with shades of white, blue and gray." Whether you choose for your home to blend in or stand out, whether you want a new look or a fresh coat of paint, combining colors in a complementary way is an important component of maintaining curb appeal.